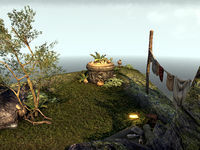 Nine-Prow Landing is a cliff on the northern tip of Auridon, located north of Firsthold. The remnants of a small camp can be found here, with a couple of skeletons, a bedroll, some empty bottles, and even a clothesline. There is evidence of religious activity, reinforced by a pedestal with a well-kept plant, some candles, and an open book, as well as the skeletal remains of someone that seems to have died in a meditative position. A troll can be found gnawing on the bones of one skeleton at the front of the camp. A backpack and copy of Auridon Explored, Chapter XII can be found near the bedroll. Two sacks are located at the foot of the pedestal. This page was last modified on 19 November 2018, at 05:56.